Bathrooms of Le Gourmet Kitchen | Le Gourmet Kitchen Ltd.
At Le Gourmet Kitchen, we understand that your home remodeling needs do not end with your kitchen. That is why we offer design expertise, product selections, and installation services for another important area in your home: the bathroom. From master bath designs to guest bathrooms to powder rooms, we have the experience and tools to help you get the most out of your room. 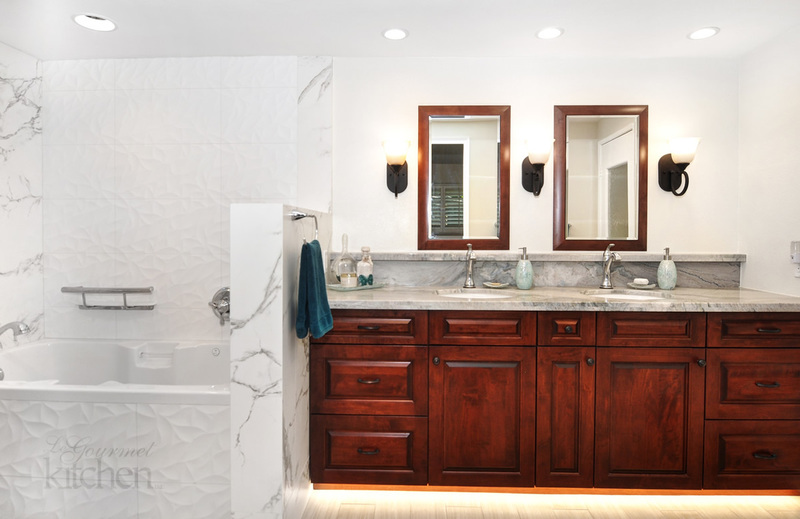 A master bathroom is not just a functional space. It should be designed as a peaceful retreat in the home; a sanctuary where you can gather your thoughts while getting ready for the day or relax in the tub at the end of a long day. We also know that not every bathroom design is the same, so we will help you pick the products, layout, and customized storage accessories that suit the requirements of each individual bathroom. We start by getting to know you, your space, and how you plan to use it. Will it be used as a children’s bathroom? Or perhaps this is a hall bath design that will be used infrequently or by guests? You might be looking for a unique powder room design to offer a welcome respite for visitors. We will create a bathroom design that meets your requirements and exceeds your expectations. Visit our Orange County showroom to talk to our design team and browse our extensive range of products, from tiles to freestanding bathtubs, shower enclosures, countertops, vanity cabinets, faucets, showerheads, and much more. Our knowledgeable, professional team will guide you through the array of products available and help you find the selections that are perfect for your bathroom design. 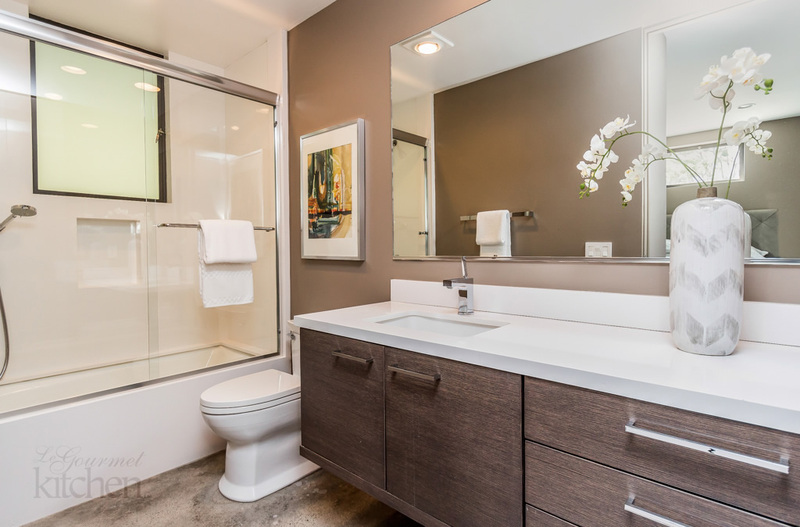 With decades of experience in design and remodeling, our team is the ideal choice for all your bathroom renovation needs. Le Gourmet Kitchen has been breathing new life into kitchens, bathrooms, and other spaces in homes throughout Orange County since 1992. Let us take the stress out of remodeling by managing your project from start to finish. You will be amazed at the difference a new bathroom makes in your home and your daily life.